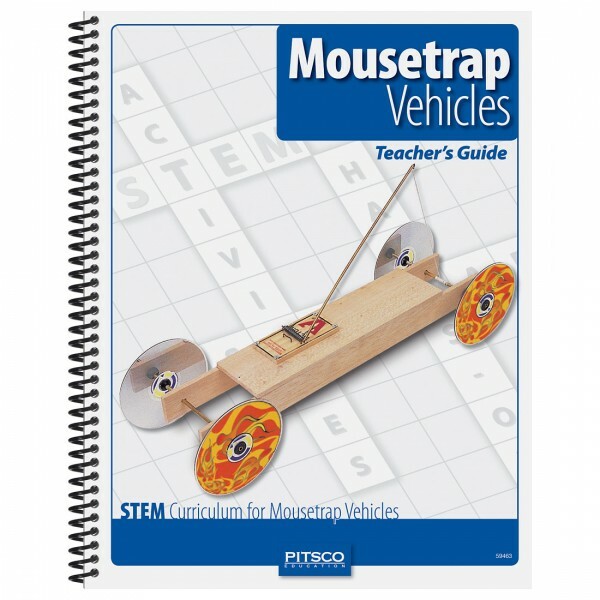 Produktinformationen "Mousetrap Vehicles Teacher’s Guide"
Examine, alter, design, and experiment with mousetrap vehicles to understand velocity, potential and kinetic energy, acceleration, speed, circumference, and distance – there’s more potential in this guide than just potential energy! The Mousetrap Vehicles Teacher’s Guide contains NGSS, CCSSM, NSTA, NCTM, and ITEEA standards addressed; teacher and student instructions for a variety of math, science, and technology activities; pretests and posttests; resource pages; and puzzles. Contains separate activities for middle school and high school students. Equipment and materials needed to complete guide activities include the Pitsco Mousetrap Vehicles – Getting Started Package, Dremel tool or portable hand drill, Timber Cutter or hobby knife, tape measure, ruler, wire cutters, needle-nose pliers, cool-melt glue gun, scale, four stopwatches, spring scale, table clamp or C-clamp, mousetrap vehicle wheels (CDs), washers, and standard classroom tools and materials. Note: This list is for all activities; individual activities don’t require all listed materials. Weiterführende Links zu "Mousetrap Vehicles Teacher’s Guide"
Unser Kommentar zu "Mousetrap Vehicles Teacher’s Guide"
Garantie(Jahre) "Mousetrap Vehicles Teacher’s Guide"
Weitere Info "Mousetrap Vehicles Teacher’s Guide"
Kundenbewertungen für "Mousetrap Vehicles Teacher’s Guide"